Intermission has got to be one of the bleakest and most violent romantic comedies ever made. Set in suburban Dublin, the film is a sprawling story featuring an Altman-esque cast of interconnected characters who break hearts and faces in equal measure. John (Cillian Murphy) and Deirdre's (Kelly MacDonald) recent break-up sets off a chain of events that includes a broken marriage, lost jobs, traffic accidents, a heroic rescue, heists, a kidnapping and a shoot-out. Caught in the middle of all this drama are John's best friend Oscar (David Wilmot), lonely and lovelorn, Deirdre's new beau Sam (Michael McElhatton) and his bitter ex-wife (Deirdre O'Kane), and Deirdre's emotionally damaged sister Sally (Shirley Henderson). 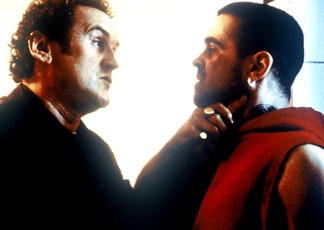 Spicing up the story's periphery are the ruthless criminal Lehiff (Colin Farrell), over-zealous cop Jerry (Colm Meany), and documentary maker Ben (Tom O'Sullivan).